This high quality aluminium cabinet is designed to be built into the wall saving valuable space within the bathroom. 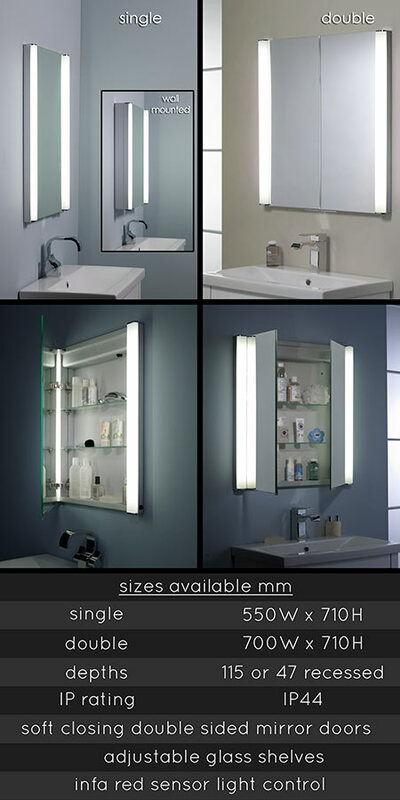 A slim mirror cabinet that is only 115mm deep and is recessed into the wall by 47mm leaving only 68mm protruding. Each recessed wall cabinet is supplied with 2 low energy strip lights which are IP rated for safe use within the bathroom. * Can be recessed into the wall. * Infa red light activation.